Hanns Eisler was the Austrian-born composer who is better known as the composer of the national anthem of the German Democratic Republic (erstwhile East Germany), and best known as the musician who had the longest association with the German playwright, Bertolt Brecht and for his film scores. But he also wrote lieder and in the sunset of his life, as he was filled with bitterness about the kind of communism that had devolved out of Marxism, his work became much deeper as he searched his soul for why socialism had failed the human being and more importantly the human heart. This is the lieder that are featured on this recording and it would be a lot more grim and unpleasant to hear were it not for the moving baritone of Matthias Goerne. The music is not just based on Mr. Brecht’s poems; there is also lieder based on the work of the great 18th Century German lyric poet Friedrich Hölderlin, some by Bertold Viertel, and others by Stephan Hermlin and Giacomo Leopardi. But the majority of Eisler’s lieder are based on the poetry of Hölderlin and by Mr. Brecht. The poetry is inspired and the lieder is wonderful and soars in the face of German romanticism and idealism that began in the age of Hölderlin and continued through the period of socialism that came to prominence after the famous treatises of Marx and Engels. Although the poetry is in part from the late 18th century, the great age of song came in the 19th century. German and Austrian composers had written music for voice with keyboard before this time, but it was with the flowering of German literature in the classical and romantic eras that composers found high inspiration in poetry that sparked the genre known as the lieder. The beginnings of this tradition are seen in the songs of Mozart and Beethoven, but it is with Schubert that a new balance is found between words and music, a new absorption into the music of the sense of the words. Schubert wrote over 600 songs, some of them in sequences or song cycles that relate a story—adventure of the soul rather than the body. The tradition was continued by Schumann, Brahms, and Hugo Wolf, and on into the 20th century by Strauss, Mahler and Pfitzner. Austrian partisans of atonal music, Arnold Schoenberg and Anton Webern composed lieder in their own style. Eisler’s may be considered in the vein of Arnold Schoenberg, with whom he studied and who introduced him to the world, but it is also true the master and student had a falling out and Eisler later broke with his teacher. 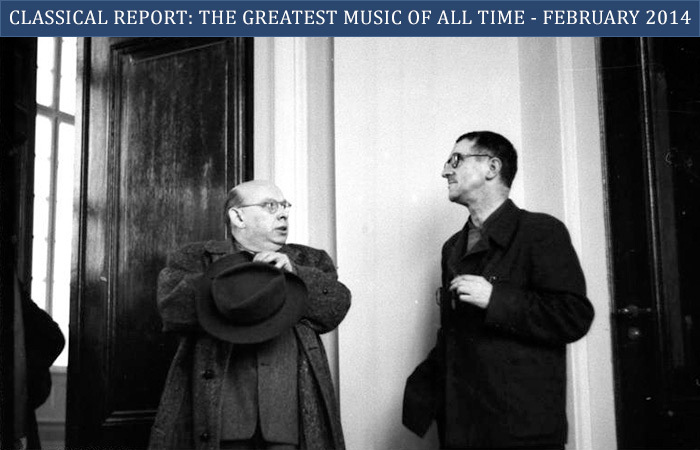 Eisler’s work—despite his fall from grace with Arnold Schoenberg and his later disappointment with both socialism and the capitalism of the US, where he sheltered during the Second World War—is music that soars almost in the manner in which spirituals soar. And despite the fact that Eisler was an atheist, somehow this was never reflected in his work. Much of this has to do with the marvelous baritone of Matthias Goerne. His is a singular voice that sometimes ranges in the realm of tenor, when he reaches for those higher notes. Mr. Goerne is poised at all times and his enunciation is flawless. His performance is pitch perfect and this goes to a voice that seemingly can handle virtually anything that is thrown at him. 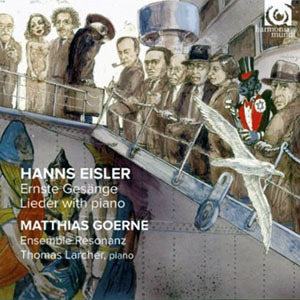 Pianist, Thomas Larcher is also part of the reason why this music succeeds. High marks must go to his ability to listen to the nuanced vocalastics of the baritone and meld this with the diacritical marks in the music. When given the opportunity to play Hanns Eisler’s Piano Sonata Opus 1, Mr. Larcher provides a command performance. His staggering performance in the 1st Allegro movement is perfectly angry and illustrates the late sensibilities of Eisler. This music is more in the vein of Arnold Schoenberg as it seeks to meld the atonalism into Hanns Eisler’s own singular methodology. Harmonia Mundi ought to be congratulated for putting out such well-performed music. It is only a matter when this will be recognised as performances worthy of wider recognition.